Orfila Vineyards & Winery (3) at 13455 San Pasqual Rd., Escondido (760-738-6500) is undoubtedly the best winery in San Diego County. It’s also the oldest active winery in San Diego County. It has won more gold medals than any other winery. And their wines have also been served at the White House. The Escondido location is the larger of the two Wine Tasting venues. The second location is in historic Julian, San Diego’s gold rush town. The Escondido location is freeway close and only 30 minutes from downtown San Diego. Plus, it’s open daily from 10 a.m.– 6 p.m. It’s a pretty hill top winery nestled in the pristine San Pasqual Valley agricultural preserve. But it gets even better. Orfila Winery is also on the way to the San Diego Zoo Safari Park. So locals and visitors alike make this a two-destination attraction when visiting this region of the county. Since its opening in 1994, Orfila Vineyards has been the recipient of more than 1,300 medals in major national and international competitions, which is a testament to their fine wines. It’s also a fun place for every event imaginable be it a classy vineyard wedding to flashy corporate party. So expect to enjoy yourself when at the winery. Plus, they have lots of events going on throughout the month. As you drive up the long winding road to this 70-acre hilltop winery let your expectations race ahead of you. For starters then have a big inviting wine tasting room with a unique four-sided wine bar enabling servers to serve lots of wine tasters at once, which is always good. Between tastings you can either take a very entertaining and informative wine tour (see below) or wander around their fascinating wine and gourmet gift section. Orfila has found the most amazing, must have wine gifts and wine accessories such as their eye catching Orfila logo cork screws, logo glasses, wire cork cases, and oversized magnums of your favorite wine. They come in magnum (2 bottles), double magnum (4 bottles), Imperial magnum (8 bottles) and Melchior magnum (24 bottles). Wow! These items are all must have gifts and souvenirs. Plus, they have a gourmet cheese and cracker section. And you have probably guessed it, Orfila Winery is also a haven for festive weddings, classy corporate events, big anniversary parties, classy and special events galore. And don’t forget that the winery is also close freeway making it ideal for guests arriving from various locations throughout the county or region. And with it’s popularity getting to the winery isn’t always possible so by popular demand you can join their awesome wine club appropriately names Orfila Lovers (OWL) CLUB. For details see below or go to their website for a more detailed explanation! As well as how to sign up! Their award winning wines are also available at select wine merchants and restaurants (via distributors and exports). The backbone of any great venue is the winery’s ownership. And Orfila Winery has been blessed with a passionate man, who comes with a great heritage in making award winning wines. Alejandro Orfila was born in Mendoza, Argentina, in 1925 to a family that has been involved in winemaking for four generations. In 1905, his grandfather established Jose Orfila Limited, a winery that still exists today in Argentina. Although he chose a career in diplomacy (his father was governor of the Argentine state of Mendoza), he never lost his interest in viticulture. Orfila studied Law at the University of Buenos Aires. Later, he studied political science at Stanford University in California and foreign trade at Tulane University in Louisiana. In 1946, he was nominated Embassy Secretary in the Argentine Foreign Service and served in many different embassies and consulates of Argentina. He was appointed Argentine Minister Plenipotentiary to the United States and served in that post until 1960. That year he was appointed Argentine Ambassador to Japan where he remained until he retired to private life in 1963. For the following ten years, Ambassador Orfila acted as a consultant in the field of international finances and economic affairs, based in Washington, D.C. In November 1973, Ambassador Orfila was appointed Ambassador Extraordinary and Plenipotentiary of Argentina to the United States and served in this capacity until July 1975. At that time, he was elected to his first term as Secretary General of the Organization of American States by its General Assembly and re-elected to a second five-year term in October 1979. After his retirement from the Organization of American States, Ambassador Orfila re-entered the business world as a consultant and investor in the field of international finances and real estate. 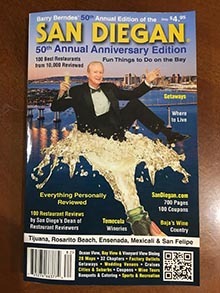 In August 1989, Ambassador Orfila and his wife, Helga Leifeld, moved to Rancho Santa Fe, California, where he engaged in real estate and community activities and purchased Orfila Vineyards & Winery in April 1994. Ambassador Orfila has been decorated by a number of European, Latin American and Asian governments and has received honorary degrees from universities in the United States and Latin America. Justin Mund, born in 1974, grew up in Healdsburg, Sonoma County, California. After high school, he attended Santa Rosa Junior College where he earned an Associates degree. While at S.R.J.C., Justin focused his coursework on wine and viticulture. Justin then spent three vintages at Ferrari-Carano Vineyards and Winery where he split his time between the cellar and vineyards. In 2000, Justin moved to the central coast to attend Cal Poly, San Luis Obispo and earned a Bachelor of Science in Fruit Science while working as a cellarman for Laetitia Vineyards and Winery in Arroyo Grande, CA. In July, before the 2002 harvest, Justin became the Assistant Winemaker for Laetitia in which capacity he remained until 2006. In June of 2006 Justin became the Winemaker for Addamo Vineyards and Winery, a small Estate Producer in Orcutt, CA. He spent the next four vintages crafting unique, critically acclaimed wines, with grapes both from the Orcutt estate and from select vineyards throughout the central coast. Justin began working with Orfila Vineyards & Winery in May 2010 and has now completed his third harvest. “I’m excited about the first vintages that we’re releasing since I started making the wines for Orfila. I believe there is a lot of potential for San Diego County wines and especially the wines of the San Pasqual Valley. I’m eager to continue to help elevate the quality and consistency of the wines we’re growing and making.” J.M. With the remarkable insight into how to best use the land for growing the right grapes, founding wine maker Leon Santoro astounded the wine industry with the quality of wines produced with their San Diego County grapes. His extensive research and experimentation resulted in the current successful vineyard configuration. Thus because of such great attention to detail and appreciation of the best way to use this land, Orfila Vineyards has became a giant in the industry. 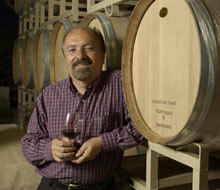 Unfortunately in 2009, Orfila Vineyards & Winery’s founding winemaker Leon Santoro past away leaving a great legacy. 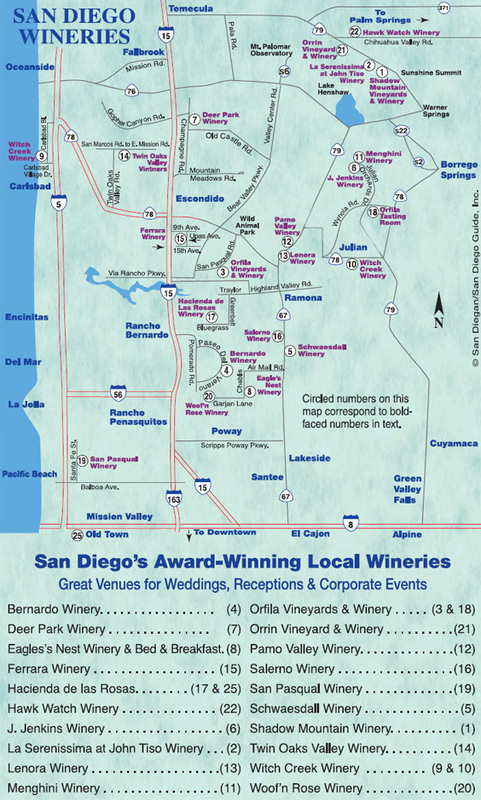 Santoro is largely credited for putting San Diego County on the international wine map. He understood all aspects of the San Pasqual Valley terroir and changed the emphasis of the vineyard from predominantly Chardonnay to Rhône style varietals. Ambassador Orfila notes Leon as the first in the region to recognize the vast potential for Rhône style wines, having determined that the soil conditions were similar to the Mediterranean region. More than 40 acres of the Orfila estate are now dedicated to Syrah, Sangiovese, Merlot, Montepulciano, Viognier, Marsanne and Roussanne grapes. An impressive selection of wines are produced from grapes grown here at this picturesque 70-acre estate including: Cabernet Sauvignon, Petite Sarah, Marsanne, Merlot, Montepulciano, Tantat, Roussanne, Sangiovese, Syrah and Viognier. Quarterly winemaker selected shipments of mixed, red or white wines, sent automatically in complimentary sturdy, insulated containers ideal for reuse and storage. 3 Winemaker selected bottles (for pick-up or ship every quarter). 4 Club shipment months per year: February, May, August and October Price are subject to chance but currently ranges from $45-$96 (+ taxes and shipping where applicable). Your credit card will be charged before the wine is shipped. Free membership consists of quarterly winemaker selected shipments of mixed, red or white wines, sent automatically in complementary sturdy, insulated containers ideal for reuse and storage. Free “V.I.P.” Wine Tasting for member(s) and 3 guests in our Escondido and Julian Tasting Rooms. Limit 4 total per membership, per person, per day. No max per year. 20% Discount off retail prices on Orfila wine and merchandise purchases (excluding End of Vintage wines and limited releases). 20% Discount on OWL shipments and Gift Orders sent with your personal greeting. Priority invitation and 20% discount to our annual Grape Stomp party (for member and 3 guests). Limit 4 discounted tickets total per membership. Free subscription to our monthly online newsletter. 10% Discount on Orfila Special Events facility fee after 1 year of membership (contact our Special Events team at 760.738.6500 x 24). 20% Discount on customized Private Label wine and hand-painted & etched wine bottles. Orfila’s beautiful winery is the ideal venue for celebrations of all types — weddings, anniversary parties, corporate events, family reunions, and community fundraisers – whenever people come together to rejoice. The winery features beautifully manicured lawns overlooking the pristine San Pasqual Valley agricultural preserve, a stunning rose garden, a romantic grape arbor, shaded tables and a spacious permanent tent with retractable sides that accommodates up to 350 people. Whether you’re looking for a casual afternoon luncheon or an elegant evening gala, Orfila offers the perfect surroundings. Groups exceeding eight people must make a reservation through Orfila’s Special Events department. Their Special Events Department (760-738-6500 X 24) [events@orfila.com] can help you plan a memorable event, pairing their award-winning wines with menus from a select list of the top caterers in San Diego, who will – and take care of every detail. ++ Plus service charge and applicable taxes. Open Daily 10:30 am to 5:30 pm. Orfila Vineyards Has a Wine Tasting Room In Julian And Is a Great Place To Sample Good Wine. This is Orfila’s second wine-tasting location and is open Monday, Tuesday, Friday and weekends 10:30 a.m.–5:30 p.m. They also sell delicious Julian apple pies ciders. You can taste six different reds and whites for ($10). The Julian Tasting Room showcases great wines, as well as beautiful gifts near the historic village of Julian, which is famous for its 1870’s Gold Rush architecture and apple pies. 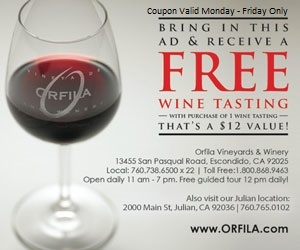 Be sure to use the Orfila Winery discount coupon for a two for one wine tasting. Their second wine tasting room is ideally located in the historic gold mining town of Julian in San Diego’s backcountry. Many wine lovers plan a day or overnight trip to Julian to stay in romantic Bed & Breakfast Inns, to sample the award winning Orfila wines, and most definitely to have a slice of Julian’s famous apple pie. You should do both. Visitors exploring the beautiful mountain resort town of Julian or the spectacular Anza Borrego Desert just east of Julian in the desert, should most definitely stop at Orfila’s charming Tasting Room. They are ideally located on Julian’s main street, which is only a block long. So you won’t have any problem finding this place. And like their main location, they have both a tasting room and gift shop features award-winning wines and a vast array of gourmet products, including local apple cider, jams, Orfila Winery signature olive oils, chocolates, local art and hand-crafted gifts. Enjoy six (6) wine tastings of your choice for ($12) per person. One free logo glass to take home is included with the paid wine tasting! Every spring Julian holds a magnificent wild flower festival. To celebrate this time of the year, you will find Ambassador Orfila’s freshly cut Lilac bouquets for sale mid March through April. Equally rewarding is Julian’s annual Grape Stomp in held at the end of every summer. It’s a must attend annual event. Fall is Apple Season in Julian! Come for the picking and stay for the wine tasting. And hot apple cider is the perfect Julian treat to warm you in the winter. Apple cider tastings are available year round. There is no doubt about it, Orfila Winery and Vineyard is the best of the best and a destination not be missed. 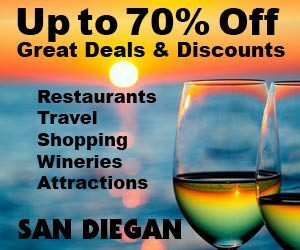 With two great venues to serve you, be it the freeway close Escondido location or a day trip to historic Julian in San Diego’s back country, you’re bound to have a wonderful time sipping wines. And don’t overlook the magnitude of opportunities to plan an event, attend an event, become a member with the perk of having their award winning wines shipped to your door. Or when you are out for the dinner look for their wines on the beverage menu. Whether you’re looking for a casual afternoon hoe-down or an elegant evening gala, Orfila offers the perfect surroundings. Their beautiful winery is the ideal venue for celebrations of all types; weddings, anniversary parties, corporate events, family reunions, and community fundraisers for up to 350 people.